Originally published under the title "'A Shocking Document' Turns 100: The Secret Agreement that Shaped the Middle East Set the Stage for Lethal Instability." Sykes-Picot created a miasma of Middle Eastern fear about foreign intervention that endures to this day. Form: Negotiated in secret by three European imperial powers, it became the great symbol of European perfidy. Not surprisingly, the Allied Powers secretly carving up the central Middle East without consulting its inhabitants prompted an outraged response (George Antonius, writing in 1938: "a shocking document ... the product of greed at its worst ... a startling piece of double-dealing"). Sykes-Picot set the stage for the proliferation of a deeply consequential conspiracy-mentality that ever since has afflicted the region. 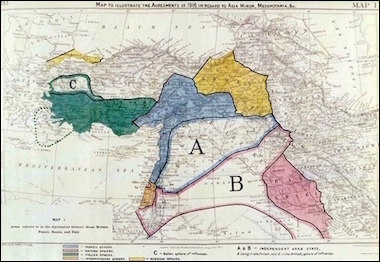 The map that accompanied the Sykes-Picot agreement. But the largest issue, of course, was the issue of control over the Holy Land, or Palestine, a problem complicated by London's having promised roughly this area to both the Arabs (in the McMahon-Hussein correspondence of January 1916) and the Zionists (in the Balfour declaration of November 1917). 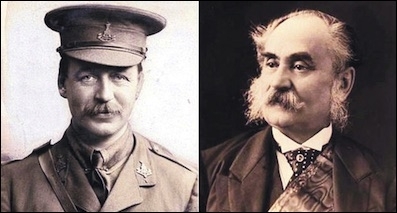 It appeared that London had not just sold the same territory twice but also double-crossed Arabs and Jews by arranging (in Sykes-Picot) itself to retain control over it. On its centenary, Sykes-Picot's central achievement, the creation of the Syrian and Iraqi states, appears to be in tatters. In a surprising parallel, each has rapidly devolved from the all-powerful totalitarianisms of Hafez al-Assad and Saddam Hussein into three micro-states. Both have an Iranian-backed, Shi'ite-oriented central government; a Turkish- and Saudi-backed Sunni opposition; and a U.S.- and Russian-backed Kurdish force. 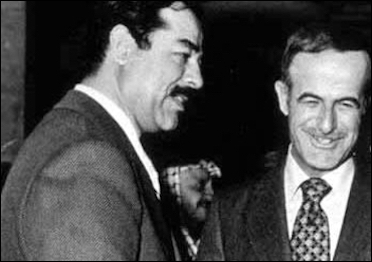 Iraq's Saddam Hussein (left) and Syria's Hafez al-Assad in 1979. 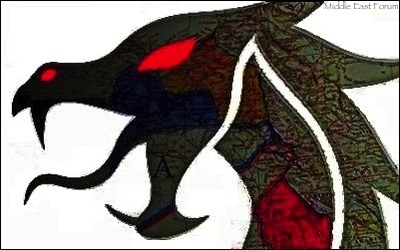 The Islamic State (or ISIS, ISIL, Daesh) proclaimed "the end of Sykes-Picot" when it eliminated border posts along the Syria-Iraq border; nevertheless, many observers, including myself, see the fracturing of these two rogue states into six mini-states on balance as a good thing because the small states are more homogeneous and less powerful than the prior regimes. Sykes-Picot has a lesson for the present day, a simple and important one: foreign powers must not attempt unilaterally to decide the fate of distant regions, and especially not in a clandestine manner. This may sound like outdated or obvious advice but, at a time of failed states and anarchy, the powers again find it tempting to take matters in their own hands, as they did in Libya in 2011, where their intervention failed dismally. Similar efforts could lie ahead in Syria, Iraq, and Yemen. Beyond those conflicts, Michael Bernstam of the Hoover Institution has argued for a broader redrawing of the region's "antiquated, artificial map."